Picture it: You are a market researcher and you have just bought yourself a new toy – eye tracking software. You give the horribly large pair of glasses to your test subject, link it up to your computers and you are ready to send your test subject to the shops to monitor how they shop and how they buy. The glasses that she is wearing are heavy and uncomfortable – they have mirrors and cameras stopping her from looking around as easily as she would like; the other shoppers are staring at her and she has become incredibly self conscious. Suddenly your new equipment stops seeming so wonderful and, even without the eye tracker, you know that the obvious flaw has been staring you straight in the face: you have to question the validity of the results. When wearing a large bulky pair of glasses and everyone is looking at her everywhere she goes throughout the entire experiment, you have to wonder whether or not your shopper shopped like she usually would – when she is not looking like something out of a cheaply made sci-fi movie? When your test subjects do not act in a realistic manner, you do not get a realistic set of results. And herein lies the problem – one which Swedish based Tobii Technology say they have solved. They have just launched new eye-tracking glasses which will help researchers get more accurate results in their studies and are a grand improvement over the older models in their shape, look and feel. The new Tobii Glasses appear much like a regular everyday pair – albeit perhaps not the most stylish – without any of the large awkward mirrors, cameras and equipment that came with the older versions, meaning that when subjects are out in a real world experiment they can feel more natural and relaxed which is the foundation for more realistic results. Obviously, Tobii has the strongest draw for market researchers and advertisers, whose job is to understand what attracts the eye, but also in social studies, sports and events planning. Even here at the IIJ, when designing our website we wanted to know what would best attract the eye to our top articles. What Tobii has done is make eye tracking accessible, no longer is it expensive and uncomfortable, but it is simple, quick and easy – but of course, there is still a way to go. The obvious next step would be to make them completely wireless, even smaller and even cheaper, but for now this is the best we have seen and we still like it. Tobii Technology, the global market leader in eye tracking, today announces the launch of Tobii Glasses™ a revolutionary, cost-effective eye tracking system. 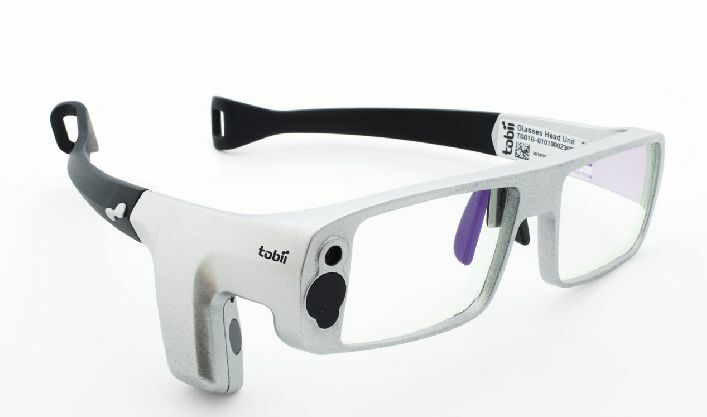 Tobii Glasses will help researchers in commercial, scientific, and government organisations to gain greater levels of insight into the preferences, reactions and personal experiences of people in a natural environment. The new Tobii Glasses look and feel like a regular pair of glasses and allow wearers to walk around freely, making it easier for researchers to create a real-world environment in which to capture user behaviour. This can be while they are browsing in shopping environments, using a computer, trying out a new product or reading an advertisement. Being comfortable and lightweight, the glasses have no distracting cameras or mirrors in the field of view nor do they require the user to carry bulky equipment. As a result, the user behaves more naturally giving the data a much higher level of validity. The automatic data aggregation made possible by Tobii Glasses removes the need for hours of manual coding and compiling of information which significantly reduces costs and time-to-market for study results. This feature ultimately means that more research can be completed at an overall reduced cost to the business. What’s stopping start-ups in the EU? What do neuroscientists really know?